To begin, there's nothing inherently wrong with your conventional goals to get stronger, leaner, faster, more powerful and so on. Conventional goals are needed, helpful and in many cases necessary ... AND they are inadequate and insufficient for most people. Conventional goals fail us more often than any of us would like to admit. Furthermore, if you are interested in your greater abilities as a human being, conventional goals almost always fail to yield post-conventional capacities. Occasionally I see conventional goals creating a training or "practice" environment for eliciting post-conventional capabilities; however, these are what I call a form of "accidental progress." These certainly happen but they are rare (my suggestion is not to wait around for a miracle). So, conventional goals are good in many ways. The more specific, measurable, attainable, realistic and defined in clear timelines the better, or so the researchers tell us again and again. However, they continue to be ineffective for most of us and they are largely impotent at eliciting integrated adaptations to the complex demands of your life. We will briefly unpack inefficiency but we will save post-conventional integrated adaptations for another blog. I will que you into some important tips for how you can move forward. 1. First, conventional goals tend to be focused on outcomes. That means they happen in the future. Keeping your eye on the future is fine, but if this is the posture of your mind during your training it will take you ten times as long to get to where you want to go. Sometimes much longer. Depending on the specificity of the goal you may never get to your desired destination. There is no short supply of drives for future change that yield negligible results. 2. Conventional goals often obscure the path to getting to your future destination. The more your attention goes toward getting to your future destination the less you pay attention to what you're doing right now and how you're doing it. Having a future aim and direction is important; however, these outcome goals only find their pragmatic strength when held in a larger context that focuses your mind upon the specific actions most essential to getting there. This brings into focus how you are engaging in the required activities. Getting the right steps is essential. What you do is paramount, but how you execute and engage the "whats" often differentiates those who achieve more and those who fail to. So once you have your outcome and you know the necessary steps to get there, focusing on the outcome more will often hold you back. I often use the analogy of a tire making contact with the road to explain this. The broader or wider the tire, the more contact you have with the road. In contrast, skinny narrow tires slip easily because they have very little surface area in contact with the road. Future oriented goals are like narrow tires aimed at getting down the road but they don't do a great job of bringing your attention into the immediacy of activity. 3. Conventional goals require lots of motivation and energy. Perhaps you have too much energy and motivation, in which case have at it. But most people lack these often seemingly scarce resources. It takes quite a bit of self-generated mental, emotional and physical energy to get you from today to your goal that may be 6 weeks away or worse yet, 3 or 6 months out. How do you sustain it? This is inevitably what we all end up asking ourselves unless we fear our survival depends upon attaining our goal. Get big enough goals with enough fear and anxiety around failure and sure you'll be "motivated," however we now have a nice recipe for adrenal fatigue, burn out and a life that is stamped with the "you're miserable" stamp across your forehead. My recommendation is goals that take aim at the immediacy of your life. Elite athletes call these "process goals" as these are the cues they must focus upon, moment-to-moment, if they are to be successful, in some cases safe. For example, a downhill skier thinking about future goals at 80 miles an hour down a mountain often results in an 80 mile an hour barrel roll down the mountain, hitting snow fencing at 60 mph, a knee surgery and 18 months of rehab. While this becomes plainly obvious in elite competitions, it is fairly easy to "check out" mentally during strength training and start thinking about your goals - or worse yet, something entirely unrelated. Your mind and body split, and in this separation goes any chance at progressing with greater efficiency. Just like the elite athlete, if you are interested in your higher capabilities it can be found in the integration of body and mind. This means your mind is focused upon the specific cues you need to execute on right here and now. My book Strength to Awaken gives you what is perhaps the most nuanced set of post-conventional process goals found in any training manual, so if you're interested in diving deeper, don't hesitate. This book can save you decades of wasted effort. For now, I want to challenge you to differentiate between your outcome goals and your process goals. Outcome goals are established, preferably with an expert, outside of the gym, before your training begins. Process goals are clarified again and again moment-to-moment in your training. Know what you're going to do before you even start. Then, once you begin focus your mind exclusively upon the quality of engagement you have with your training. Mind and body come together and then the fun begins. PS: If you're looking for some process goals that might evolve your training, sign up for my free 12 training tips - you'll learn some within these short tips. You can find it in the sidebar at the top of my home page. Caution: Don't Train This Way! 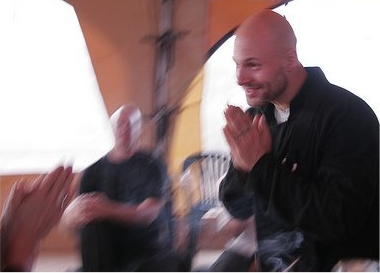 Last week at the Integral Center I was fortunate enough to sit down with my Strength To Awaken small group plus a handful of people from around the world visiting Boulder for the Whats Next Conference. Again, motivation was a big topic. I think it is the major challenge for most people when it comes to training. I'm going to share with you part of what we explored together because it is essential. If you don't get this there's a very good chance you are digging yourself into a ditch that quite honestly you probably don't want to dive into. Whenever I speak about motivation I end up talking about discipline. They are interwoven in complex and important ways. 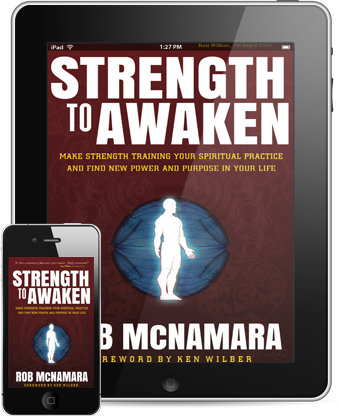 For those of you who are already receiving my free 12 Training Tips, you'll hear more about this topic there and for those of you with my book Strength to Awaken in your hands already please see Chapter Nine for a deeper dive. Right now though, we are going to cut right to the heart of the problem. Conventional discipline divides your mind. Conventional approaches to training divide your mind. The common element I'd like you to que into is the divided mind. Is your mind divided now? Chances are it is. This is a problem. It is actually a very big one although it's probably familiar so you likely aren't that concerned. Having a mind that is divided is kind of like having your kitchen roaring in flames. Go on, picture that. You're in the living room going on as usual simply because you're used to that fire. - both block you from nourishment you need. - both keep you out of places in your life you need to go. The divided mind can be defined as two or more oppositional drives inside of you with divergent agendas. Part of you is going this way and part is headed that way. Most of the time these discordant drives are in a struggle with precisely what is happening in the present moment. Strength training, or any kind of training, from this divided mind is a tremendous waste of energy. It is inefficient. It wastes time. It steals your enjoyment and pleasure. The divided mind is what most adults live in. They haven't grown their mind to become strong enough to unify and cohere a drive that brings the mind into a synergy. Don't get all hard on yourself here, research suggests that less than 1% of adults do… this is our potential not where you "should be already." So, training with divisions in your mind is the common climate of most people in the gym. And it also shows up in bed, in the office and in cars on the drive home. The problem is that training is supposed to be an activity that you do for a short period of time that carries you forward. Do this and it will take you FORWARD. Training a divided mind may give you some relative physical benefit when compared to a sedentary lifestyle; however, it often fails to draw you forward in any legitimate fashion. Instead, conventional training results in more division within yourself. Mentally you are not training, you're simply rehearsing or repeating. You're getting better at something that you already know how to do. If you're like most adults you are not in any need on developing the ability to waste time and energy, be inefficient and erode your own joy and pleasure in or out of the gym. I think these come built in, they are not our future but our current predicament. Stop repeating the habit of dividing your mind when you train. See what happens when you draw your mind into a greater coherence. Divide your mind and will likely find yourself saying that you are "struggling with not having enough motivation" as I hear often. Bring your mind into its larger resonance and direct it completely into the activity of your training and you will discover the heart of discipline. Become your mind's larger coherence and you will save time and energy, you will become more efficient and proficient. You will discover more joy and pleasure. And if you do this in your training you'll be shocked at how simply a unified and coherent mind shows up in other facets of your life. Most people struggle with motivation in one way or another and when it comes to embodiment, motivation is one of the perennial obstacles. Most approaches to dealing with the obstacle of motivation, whether it's related to embodiment or something else, lack the architecture to take you from where you are to where you need and want to be. Most approaches are obligatory in nature, coercive by design and pretend that hype or excitement is sufficient. Take a look around and you will see "experts" rousing excitement and energy, manipulating people with the best of intentions (sometimes) and reinforcing obligations. The problem is 99% of all of these fail and the reason why that 1% does work has little to do with the "expert's" conventions and everything to do with a simple yet profound shift in you. You and I both know this. Most people are colluding with the fantasy that you do not have enough motivation, and by getting more (somehow), you can actually get to where you want and need to be. Your motivation, right now, is sufficient to change the world. The power you possess is immense. Quite honestly I don't think any of us truly understand, appreciate nor access the strength, elegance and capacity that resides within the human vehicle… right now. You likely do not lack motivation. There is often something more complex and underlying at work in the human being, which is why so often mainstream approaches to 'change' fall short of being able to bring us to our larger potential as people. So if the amount of motivation is not the real problem, what is? Meaning-making is the essential nutrient for the mind. It's like what oxygen is for the body. Furthermore, meaning-making manifests into each of your cells, the expression of your DNA and literally permeates every facet of your being. You are doing meaning-making all the time and issues around so-called motivation are just about always rooted in the meaning-making system. One of the fundamental patterns within human meaning-making is the movement toward significance. When I use this word, I am talking about what matters most, what captures your attention and engagement and what ultimately brings structure to how and what you perceive. Significance is ultimately what draws humanity towards greater and greater degrees of 'progress.' Whatever your meaning-making system holds as significant, take note, you will not have a problem with motivation. It's hardwired in you. You will methodically - sometimes obsessively - pursue that which is significant to you, whether conscious or unconscious. To be clear I am not talking about what you "think" should be significant in your life. That's one step removed from what you at a fundamental level presume to be significant. Instead, I'm asking you to consider deeper levels of how you engage your world, your relationships, your inspirations and intentions. Consider this: the vast majority of the elements we hold as significant at a fundamental level are not your's. They belong to the fabric of your culture(s) and have more or less chosen you. It's not the other way around. For those of you who are more developmentally privileged you know that you can "out grow" your unconscious loyalties to your cultural presumptions as to what holds significance and what does not. By doing so, you can actually start to choose, author and create your central significances that will drive your motivation in life. But this requires a series of major transformations in developmental complexity to get to this "self-authoring" stage. So when struggling with motivation, one of the short hand assumptions to explore that I use with my clients is that in this particular area of their life, they are perhaps functioning out of socially defined loyalties, or earlier more self-centered modes of complexity that are largely unconscious. Which leads me to embodiment and motivation. We in the West, as far as I can tell, are by and large developmentally stunted around embodiment. This is largely a cultural construct that most of us participate in. It isn't that we aren't capable of being more fully embodied human beings, it means we live within systems that fail to support our emergent embodiment as our larger potential. Embodiment is mis-perceived to mean the "body" as we tend to think about it in the Western medical model. The body is then presumed to be "fundamentally" important - not "significantly" important. When this perspective is inhabited, motivation naturally moves towards other objects, investments, and loyalties in your life and embodiment holds a less significant place. It is here in the inner architecture of meaning-making that we find the root of "motivation" issues around embodiment. Even in the face of death, human beings all too often fail to un-couple their attention, energy and genuine commitment from their habituated ways of living. That's how strong meaning-making is, it can change the world and it can put you 6 feet under. 1. Free your unconscious loyalties and habituations from your historical conditioning. This frees up your motivation to be conducted into your larger significance in life. 2. Closely inspect your meaning-making. This is hard to do on your own. Find someone with greater clarity, elegance, more experience and more flexibility than you possess. Get their help. This is very hard to do on your own because it is precisely your own meaning-making that is often holding you back. 3. Discover what has already chosen you, that is also liberated from cultural conventions, and participate with embodying this greatest significance… Right Now! For those of you wanting an overhaul on your meaning-making system around embodiment, I want to recommend my book Strength to Awaken. It is "psycho-active" meaning that simply reading it rewires and evolves your own complexity around embodiment. Check it out, you are likely to find yourself inhabiting a different landscape when you think of strength training, embodiment and/or any other movement discipline. Finally, help me kill the presumption that human beings are lacking motivation. Let's stop colluding with the premise that we lack motivation and start participating with the immense power that is the future of our co-creative evolution. I'm co-evolving embodiment, right now. What are you participating in that unfolds your greater elegance as a human being?